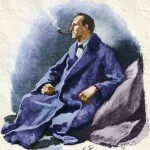 Arthur Conan Doyle was educated at a Jesuit boarding school. His outspoken nature and intellectual curiosity did not make him popular with his teachers. This part of Conan Doyle’s life was difficult, but was made more bearable by the sporting events at school. Conan Doyle was a natural athlete and took part in cricket, football (also known as soccer in the United States), hockey, swimming, and rugby. The Jesuit school, Stonyhurst, also had some sporting games of its own invention. “Trap” was a game like tag. “Cat” was a game somewhat like softball. 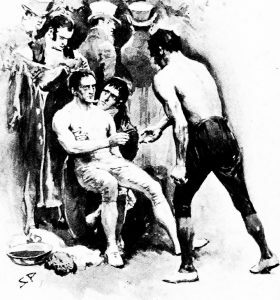 Conan Doyle truly believed that boxing was a “manly art.” It plays a strong part in some of his short stories including Rodney Stone, The Croxley Master, The Lord of Falconbridge and The Bully of Brocas Court. Above all, I learned a fact which I would whisper in the ear of every other man who starts, as I have done, a stranger among strangers. Do not think that practice will come to you. You must go to it. You may sit upon your consulting room chair until it breaks under you, but without purchase or partnership you will make little or no progress. The way to do it is to go out, to mix everywhere with men, to let them know you. 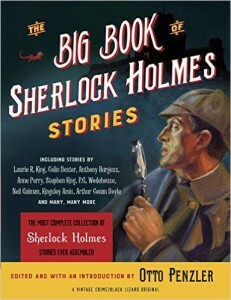 Conan Doyle joined many types of clubs and organizations including sporting clubs. He joined the Southsea Bowling Club, the Portsmouth Cricket Club and helped organize the Portsmouth Football Club. Conan Doyle was one of the earliest motorists in Britain. He was so taken with this new invention that he apparently bought an automobile without ever having driven one before. The first time he ever drove a car was when he took his car home from the dealer—275 kilometers away from the Conan Doyle residence! In 1911 Conan Doyle took part in the International Road Competition organized by Prince Henry of Prussia. Known as the Prince Henry Tour, this contest was designed to pit the quality of British automobiles against German automobiles. The route took the participants from Hamburg, Germany to London. Conan Doyle teamed with his second wife, Jean, as one of the British driving teams. 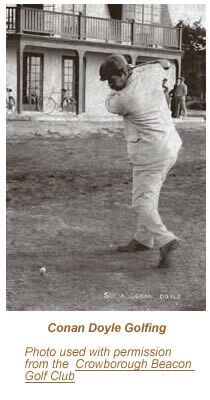 Conan Doyle golfed whenever he could. As a world traveler this enabled him to play under many, and sometimes adverse, conditions. In Switzerland the cows were hard on his self-made golf course. They knocked down his flags. As if that wasn’t enough, they would also eat the flags. He was Captain of the Crowborough Beacon Golf Club in 1910 and his wife was Lady Captain the following year. 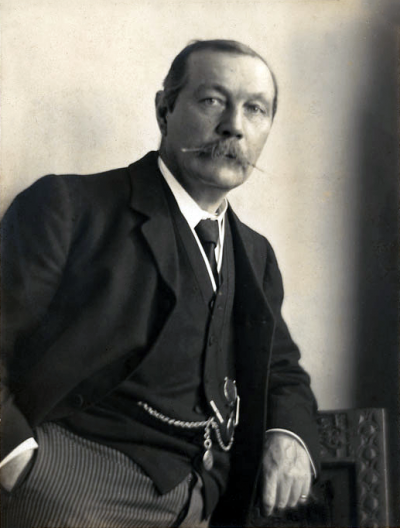 Arthur Conan Doyle is widely known as the creator of Sherlock Holmes. A little-known fact is that he also helped to make skiing popular in Switzerland. 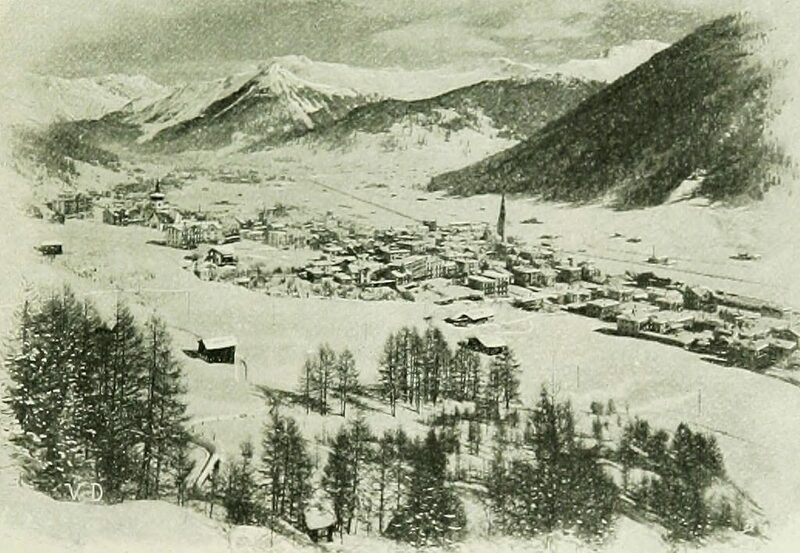 He would later say, "On any man suffering from too much dignity, a course of skis would have a fine moral effect." Conan Doyle said this about sports, "To give and to take, to accept success modestly and defeat bravely, to fight against odds, to stick to one's point, to give credit to your enemy and value your friend - these are some of the lessons which true sport should impart."